The world is experiencing an unprecedented run on gold. While paper gold plummets, people are buying up gold like there is no tomorrow and while the media is saying all is lost and gold has done its dash, banks, countries and institutions, as well as individuals, are buying up as much gold as they can get their hands on. The Perth Mint reports a record highest activity of the year and, recently, one of the best days out of the past year. The demand for gold coins has skyrocketed with sales of Australian gold bullion coins increasing by almost fifty percent in the first quarter of this year compared to the previous year. And over in Japan, gold merchants who normally see long lines of middle income and older Japanese cashing in on long held unwanted jewelery are now experiencing the reverse. Buyers of gold now outnumbering sellers, with buyers waiting up to three hours at Ginza Tanaka, the main shop of Tanaka Holdings, to make a transaction. It was recently reported by a Ginza gold merchant that buyers had taken about 6 kg of gold home by early afternoon on Tuesday last. One 60-year-old man walked out of the store with 500 grams of gold for about 2.2 million yen ($22,500). Meanwhile, In China and Thailand the rush is on to buy gold as a result of the new forced low gold price. According to the Financial Times, "The feverish buying has left many of Hong Kong's banks, jewellers, and even its gold exchange without enough yellow metal to meet demand. In Shanghai the gold exchange saw volumes -- often seen as a proxy for demand -- rising to a record on Monday, while queues formed outside some jewellery shops in Beijing" And Haywood Cheung, president of the Hong Kong Gold & Silver Exchange Society, said the exchange has basically run out of gold. "In terms of volume, I haven't seen this gold rush for over 20 years," he said. "Older members who have been in the business for 50 years haven't seen such a thing." Back in the good old US of A, gold dealers are reporting a brisk demand for gold and silver. Silver is commanding a 20 percent premium and considered cheap at the cost due to the difficulty in getting any. Delivery times are reported as being around 5 to 6 weeks. A number of analysts have questioned the paper gold plunge and questions are now being asked if JPMorgan, and to some extent the HSBC really have the gold to substantiate the massive sell off recently. 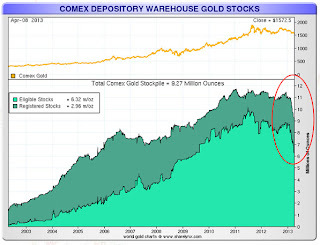 As the Comex gold inventories, in fact, have plunged by the largest amounts on record contrary to media ‘reports’ that inventories have increased (see chart) and,instead of inventories increasing by the largest amounts on record, which is what the mainstream media would have you believe, the opposite is true. Gold is gold and paper is paper. A paper manipulation does not blind people to the true value of gold. Gold buying is still highly popular as it has been for centuries. The recent artificial dipping of the futures gold price has only served to give more people a better advantage to buy gold. There is indeed a gold run.